Product prices and availability are accurate as of 2019-04-19 23:38:28 UTC and are subject to change. Any price and availability information displayed on http://www.amazon.com/ at the time of purchase will apply to the purchase of this product. AMICO Power 3-IN-1 MIG/TIG/STICK Arc Combo Welding Machine, Very Easy to weld 3/8" Aluminum, MTS-185 is the perfect choice for projects and repairs around the home and auto body shop. This welder can work well with solid wire and flux wire as well as aluminum wire. 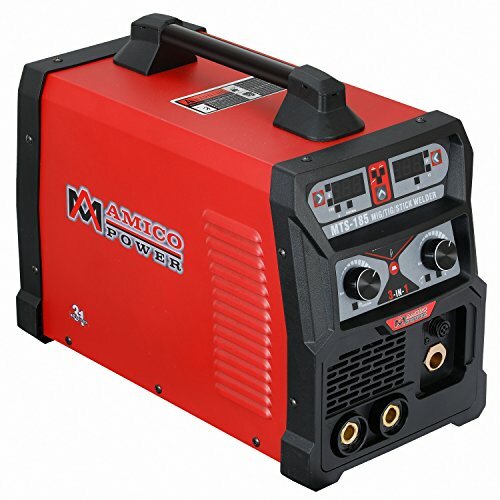 It also has the TIG and STICK function, can weld steel and stainless steel perfectly. The welder output range 10-185 amp. It uses standard flux-core wire(E71-gs) or steel wire 0.6-0.9mm, and aluminum wire. It has settings to easily adjust the output according to the thickness and changing the polarity according to the type of wires.Specifications: Welder Type: 3-IN-1 MIG/TIG/STICK Combo Welder, Output Terminal Type: Direct Wire, Power Supply: AC 100V-240V/Single Phase/50-60Hz, Effective Input Current: 115V: 29.5A(MIG)/19.3A(TIG)/32.4A(STICK); 230V: 23.3A(MIG)/14.3A(TIG)/22.9A(STICK), Maximum Input Current:115V: 38.0A(MIG)/24.9A(TIG)/41.8A(STICK); 230V: 30.0A(MIG)/18.4A(TIG)/29.6A(STICK). Current RangeOutput:MIG:115V/50A-140A, 230V/50A-185A; TIG: 115V/10A-120A, 230V/10A-160A; STICK: 115V/10A-120A, 230V/10A-160A. Nominal DC Open Circuit Voltage (OCV): 56V, Welding Output,104F(40C),10 min(230V): MIG: 185A/23.2V, TIG: 160A/16.4V, STICK: 160A/26.4V. Duty Cycle: MIG: 60% at 185A, 100% at 143A, TIG: 60% at 160A, 100% at 123A, STICK: 60% at 160A 100% at 123A. Efficiency: 93%, Power factor: 0.85, Cooling Method: Fan Cooled. Includes:13 ft.200A pro. MIG gun and cable assembly, 13 ft.200A pro. 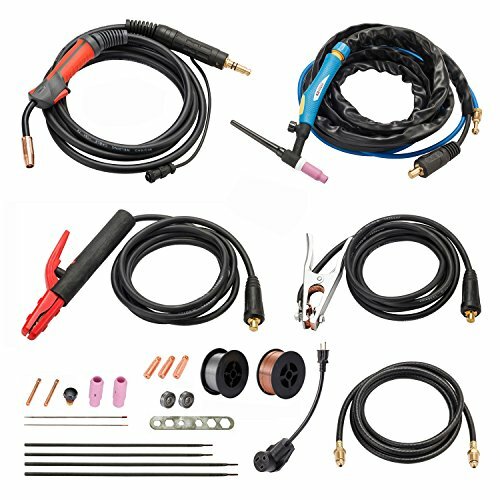 TIG Torch gun and cable assembly, 10 ft.500A electrode holder and cable assembly, 10 ft.630A work clamp and cable assembly, 110V/240V power plug adapter, 8 feet air hose use for Co2 and Argon connect, 1 spool 2 lbs. aluminum wire use for MIG weld, 1 spool 2 lbs. steel wire use for MIG weld, 2 pcs tungsten Needle use for TIG weld, 4 pcs electrode use for Stick Arc weld, 1 U-drive roll for 0.030" & 0.035" (0.8mm/0.9mm), 1 V-drive roll for 0.023" & 0.030" (0.6mm/0.8mm), Quick manual & Owner's Manual. 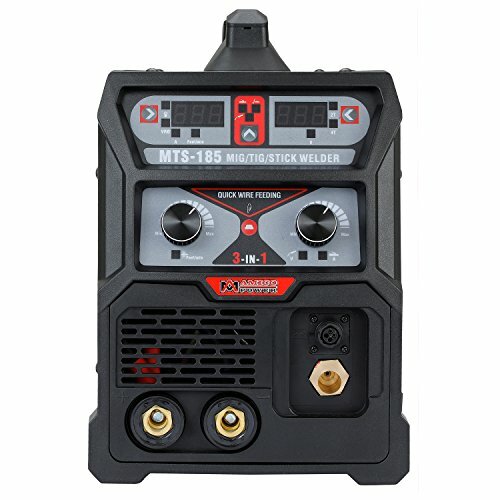 MTS-185 multifunction 3-in-1 MIG/TIG/Stick Arc professional combo welder, capable of welding up to 3/8" aluminum, alloy, mild steel, weld steel, stainless steel, copper and cast Iron.It can work well with aluminum wire, solid wire and flux cord wire, it also has the TIG Torch and STICK function, can weld steel and stainless steel perfectly. Advanced IGBT technology, featured wave-form control system, perfect waveform of volt and amp during, short circuits and arc burning cycles. Synergic controlled, it has settings to easily adjust the output according to the thickness and changing the polarity according to the type of wires. Very clear wire melting droplet transfer, very few spatters. fast, precise, clean arc ignition and arc ending. Using high quality wire feeding machine(iron) to ensure smooth wire feed, especially when using aluminum wire welding aluminum, with 2T/4T torch control. automatic control gas solenoid valve has been installed inside the machine. Automatic compensation for voltage fluctuation, over-voltage protection, under voltage protection, over current protection, over load protection, automatic temperature control, fan dormancy, steeples amperage control.